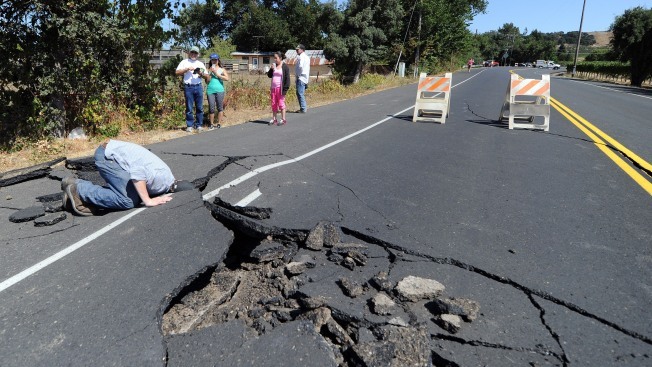 A 6.0-magnitude quake jolted the Bay Area early Sunday morning, sparking fires, damaging buildings, injuring scores, knocking out power to tens of thousands and sending residents running out of their homes in the darkness. The temblor struck southwest of Napa at 3:20 a.m., causing houses to shake in the center of San Francisco and as far away as the Nevada border. The USGS briefly upgraded the magnitude to 6.1 before downgrading it. Gov. Jerry Brown declared a state of emergency after Napa fire officials said the city had exhausted its own resources extinguishing six fires, transporting injured residents, searching homes for anyone who might be trapped and answering calls about gas leaks, water main breaks and downed power lines. All Napa Valley Unified School District schools will be closed Monday to inspect for possible damage. Napa Valley College did not suffer any major damage and will be open on Monday. Queen of the Valley Medical Center in Napa handled more than 200 patients who sought emergency care, hospital officials said. Of the 208 patients, 17 were admitted to the hospital with broken bones and respiratory or cardiac conditions, while the rest were treated and released for less severe injuries, hospital president Walt Mickens said at a Sunday evening news conference. Only one patient remains in the hospital in critical condition while another, a 13-year-old boy, was airlifted to another trauma center in critical condition after pieces of the fireplace at his home collapsed onto him, Mickens said. The boy was listed in serious condition at UC Davis Hospital as of Sunday night. 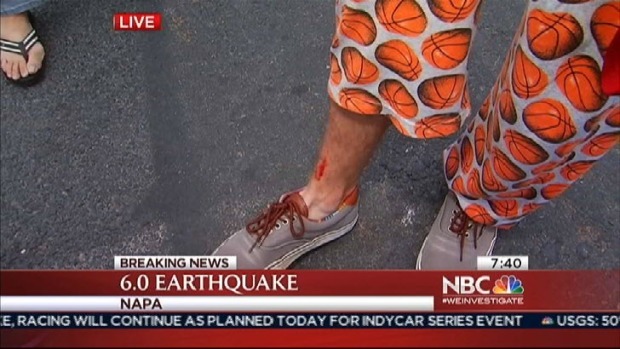 "Our community has responded in an extraordinary fashion here in Napa," Mickens said. Some 90 to 100 homes and businesses across the region were not habitable, according to Mark Ghilarducci, director of the California Governor's Office of Emergency Services, The Associated Press reported. There were at least 50 aftershocks, including four that were larger than 2.0 magnitude in Napa, ranging in magnitude from 2.5 to 3.6, according to the U.S. Geological Survey. Thirty to 70 small aftershocks could hit the area in the next week, USGS said. The intersection of Third and Brown streets in downtown Napa showed signs of substantial damage, including fallen trees, broken awnings and the facade of a building falling on top of a parked car. The city has red-tagged at least 33 buildings, meaning they were not considered safe for the public to enter. City officials in Vallejo said dozens of buildings have been red-tagged. Most of the buildings authorities red-tagged in Vallejo were commercial or industrial. Back in Napa, dazed locals could be seen wandering around the downtown area in the early hours of the morning. 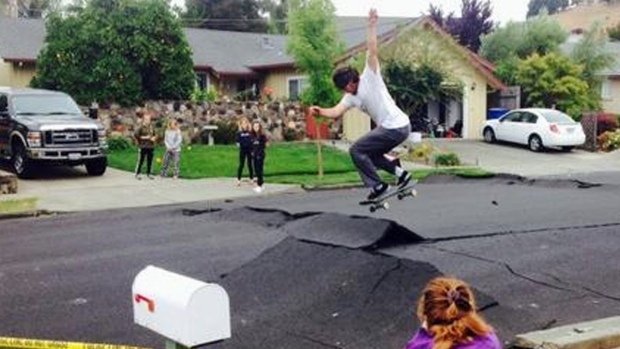 The strong 6.0 quake near Napa caused streets to buckle and create ramp-like formations for skateboarders to jump. "I was in bed ... It was a sick feeling. The ground was just rolling," lawyer Jeff Hammond told NBC Bay Area. "That used to be my office," Hammond said pointing at the city's old courthouse that was built in the 1870s and lost a 10-foot chunk of bricks and concrete. "The building is not earthquake-proof, so who knows what the damage is inside. This is obviously the worst we've ever seen here. Napa is going to survive this but it's hard to see though." Napa Fire Capt. Doug Bridewell called the earthquake "the worst shaking I've ever been in." Eighteen-year-old Christian Ray described how the earthquake jolted him and his mother out of bed. "I just heard shaking, and I got really scared," he said. "I heard my mom screaming for my name, and I thought, 'What's going on?' I thought something terrible was going on. "My dresser fell on me and cut up my legs, and then I saw my mom come into my room. She fell, tripped over all my stuff," he said. "Our room is just terrible. It's destroyed, and everything is on the floor, flipped over. It's pretty amazing." Christian Ray tells NBC Bay Area's Cheryl Hurd how strong the quake felt and how he injured his leg trying to get to safety. 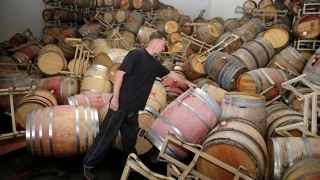 David Duncan, president and CEO of Silver Oak winery in Napa, tweeted about waking up to hundreds of bottles destroyed in the quake. The popular Napa Wine Train canceled its operations for Sunday in order to inspect their trains. The California Highway Patrol reported earthquake-related damage in four places this morning, including parts of Highway 121 and Petrified Forest Road at Saxton Road in Calistoga. However, all roads remain open to the public at this time. The shaking emptied cabinets in homes and store shelves, set off car alarms and caused damage inside homes in neighboring Sonoma County. Cheryl Hurd talks to Napa residents devastated by the 6.0 quake. Marsh said the power went out right away, and he started walking toward his garage to get a flashlight. Broken glass was everywhere. 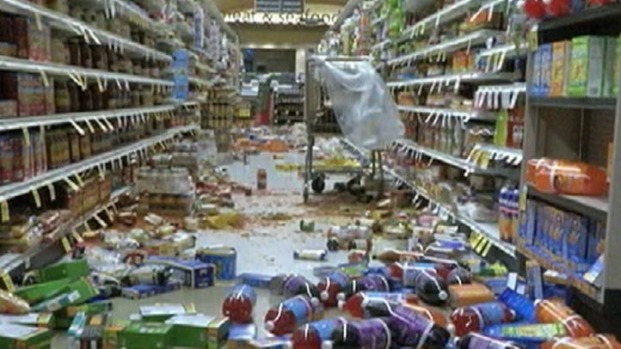 A preliminary magnitude 6.0 earthquake struck the Bay Area near Napa early Sunday morning. USGS said the quake struck about 10 miles northwest of American Canyon, which is located about 6 miles southwest of Napa. 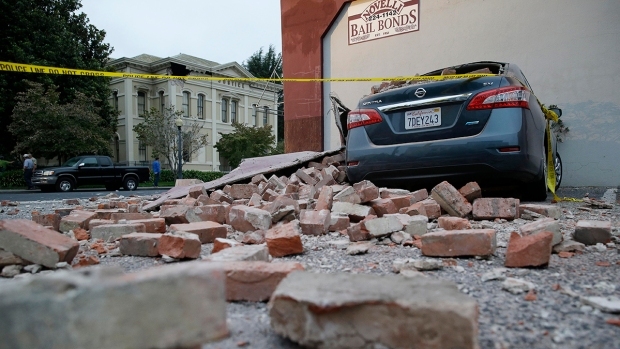 Most reported damage has been confined to Napa and Sonoma areas. About 30 to 70 small aftershocks are expected over the next seven days, the USGS said on Twitter. "I was at work when it happened," said David Lew, who works at a casino in American Canyon. "My absolute first thought was getting in touch with my wife, who is five months pregnant." NBC Bay Area's chopper footage over downtown Napa showed a mobile home park on fire at Orchard Avenue and a gaping hole near the top corner of the old courthouse. At least four mobile homes have been destroyed. Gas leaks and water main breaks were also reported. As of 4:00 a.m. Monday, power had been restored to 99 percent of those who lost it following the quake, leaving 150 people in the dark, PG&E said. That was down from 70,000 customers who lost power right after the quake struck. David Schwartz of the USGS talks with NBC Bay Area's Sam Brock about Sunday's 6.0 quake. California Gov. Jerry Brown said Sunday morning that his emergency services offices was on full activation and working closely with emergency managers, first responders and transportation officials to help residents and vital infrastructure. "These safety officials are doing all they can to help residents and those living in affected areas should follow their guidance and instruction," he said. People took to social media to share news of the quake. NBC Bay Area Chief Meteorologist Jeff Ranieri reported feeling a "violent shaking or rolling motion" for around 20 seconds. "The most important thing for people to remember is drop, cover and hold if we do happen to get another big one," Ranieri said. "If you smell gas it probably means there is a gas leak." There was no report of damage to the Bay Bridge or any other major bridge in the Bay Area. "It's certainly a jolt and reminds people we live in a place where large earthquakes occur," said David Schwartz of the USGS. "We will be looking for the rest of tonight and tomorrow. Our seismologists are taking a closer look. People can expect smaller aftershocks to continue." Nearly 50 people have registered for services at an American Red Cross shelter in Napa, a Red Cross spokesman said. Nineteen families – 47 people –registered at the shelter at Crosswalk Community Church at 2590 First St., Red Cross spokesman Woody Baker-Cohn said. Baker-Cohn said the church opened around 9 a.m. as a place for people to come get food, drinks and information about the services they can receive following the quake. However, he said by noontime it was clear that the church would have to open as a shelter because most of the people that came were renters with no insurance or family in the area and would need to stay overnight. The gymnasium at the church is able to accommodate 100 people and there is another shelter also open at Florence Douglas Center at 333 Amador St. in Vallejo, he said. Napa city officials advise residents who lost water service during Sunday's earthquake should use bottled water for drinking and cooking, boil tap water for one full minute before use for drinking or cooking or to use water for drinking and cooking from one of the water stations set up by the city. The water stations can be found on Pearl Street one block west of Main, or at the Las Flores Center on Linda Vista Avenue. Residents should call 707-257-9544 with any water-service questions. Information from USGS on the earthquake can be found here. View liquefaction hazard maps from the USGS here. Cathy Rainone, Bay City News and the Associated Press contributed reporting.